Build a USB LED torch using a clear white LED, resistor and type A USB connector. This easy project for beginners in electronics requires some soldering. The USB torch can be powered from any five volt USB host port such as the port on a portable USB power bank. A USB power bank is just a USB rechargeable battery that already has an on/off switch and will supply 5V from a USB host port. They are usually sold as a battery pack for charging portable devices on the go. The torch can be used as an emergency backup torch or lighting in case of power failure. It could even be plugged into a USB extension cable and powered from a laptop USB port to act as lighting in case of power failure or blackout at night. The circuit diagram and an image of the parts are shown below. The red LED on the left of the image was originally made for testing the presence of power on a USB port – here it is used to show the wiring of the LED. The series resistor (R1) is hidden under the black heat shrink sleeving. The LED on the right of the image is the clear white LED in the assembled USB LED torch. Some pretty detailed parts and part numbers from RS Components are shown in the parts list. The exact parts are not necessary and most clear white 5mm LEDs that are bright enough should work. Other parts can be substituted with equivalents that should be available from most electronics supply shops. Data sheets and more details on each part can be looked up on the RS Components website by using the RS part number. The LED specified has a reasonably high forward voltage drop (3.3V typical), so a low value resistor (100 ohms) is used. The circuit will draw around 17mA from a 5V power source. The video below shows how to assemble the torch and the shows a few test of the torch using the battery pack from the components list. Start by cutting the resistor leads and LED cathode lead (the shorter lead on the LED – negative) so that when the resistor is soldered to the cathode lead, the resistor and cathode lead will be the same length as the LED anode lead (anode lead is the longer lead – positive). Leave enough length on the resistor leads to overlap the cut LED cathode lead for a good solder joint. Enough length must be left on the other resistor lead to solder it into the USB connector. Solder the cut resistor onto the cut LED cathode lead. Melt some solder into both the positive and negative solder terminals of the USB connector. Cover the LED anode and resistor with a piece of 2.4mm black heat shrink sleeving, leaving enough of the resistor lead sticking out to solder to the USB connector. Solder the resistor lead to the negative USB solder terminal. Put a piece of red heat shrink sleeving onto the LED anode lead, leaving enough of the lead sticking out to solder to the USB connector. Solder the anode lead to the positive USB connector solder terminal. 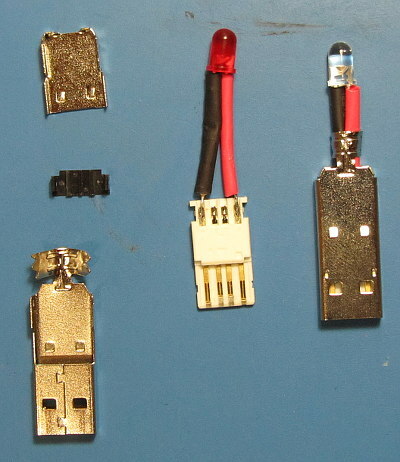 When the soldering is done, the USB connector can be assembled. Place the small black plastic cover over the soldered terminals. Insert the body of the USB connector into the USB metal housing and snap the metal cover in place. The supporting metal tabs of the USB connector can now be bent over the insulated LED leads. Do not crimp them too tightly. Simply plug the torch into a USB battery pack or other USB power source to see that the LED switches on.